Region: Central and Northern part of Mongolia. Explore Ulaan Baatar and Buddhist monasteries. Journey through dramatic deserts, endless steppe and forested mountains. Stay in gers and discover the Mongolians' fascinating nomadic lifestyle. Visit shankh monastery:Shankh is the oldest monastery in Mongolia, founded in 1647 by Zanabazar (1635-1723), a revered sculptor, politician, religious teacher, diplomat and living Buddha, who became Mongolia's first Bogd Khan (God King). Known as the West Monastery, it was one of the foremost seats of Buddhist teaching and practice in the country for almost three centuries. At its height, Shankh consisted of several schools specialized in Tantric rituals, particularly the Kalachakra, philosophy and astrology. It housed over 1,500 monks and served the religious, medical and educational needs of the region. The creation work temple established by Undur Gegeen Zanabazar in 1654 dedicated to religious study and art works became the foundation of today’s Tuvkhun Monastery. It is located on a rocky mountain hill surrounded by forests elevated in 2300 meters above sea level. In 1651, the first religious statesman Zanabazar built a small stony building and he created Soyombo letters in the building. The monastery is located in natural rocky landscape where there is a small cave named “Mother’s abdomen”. The Mongols still protect this unique place as naming it as a “Country of Mahagal”. These monuments were created during the war between Khalkh and Uuld and the the Door of Great Pleasure is a tunnel dug through the mountain. During the war the Under Gegeen escaped through this tunnel and intentionally closed the hole by a big stone. The monastery was taken under the state protection in 1992. Have a breakfast and lunch at the tourist camp. There is a horse riding available at the National park. Afterwards drive to Jargal jiguur. Stay overnight in ger at the tourist camp. 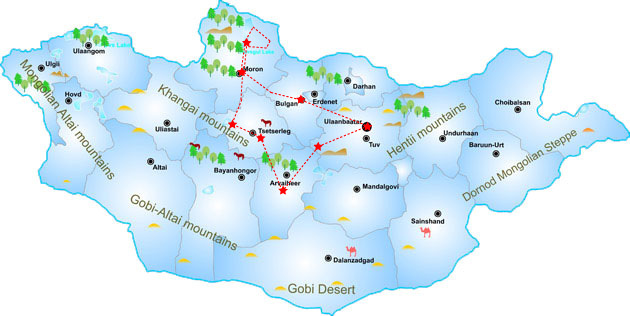 The monastery was established by order of Manju emperor Enkh- Amgalan Khan, to cherish and give respect to the Undur Geghen Zanabazar, his skills, wisdom, intellect and accomplishments. One hundred thousand langs (=3730 kg) of silver from the state fund were used to build a magnificently styled place for Buddha teaching and practice in honor of Zanabazar. After searching for a suitable place, the construction works of the monastery called “Amarbayasgalant ‘’, a palace for God `s meditation, began in the year of red horse, 1726, and was completed in the year of red dragon, 1736. Out of deep respect the monastery was then offered to the Undur Geghen. Drive back to Ulaanbaatar, transfer to the hotel and do shopping including State department store and cashmere shops. Enjoy watch national folklore performance by “Tumen Ekh” national song, throat singing, tsam mask dance and so on. A farewell dinner and stay overnight in hotel.